And now, my friends, we examine The Case of the Stock Mystery Title. Starting the title of your work with the magic words, "The Case of..." is a great way to tell your readers that what they are about to encounter is a mystery or involves mysterious events. This is particularly common in Detective Fiction, where the detective is presumed to have a collection of case files, which some fictional biographer may be sorting through for publication. One common variant is to interject an adjective before the word "case". This adjective will usually serve to heighten the sense of mystery. Words like "Curious" or "Strange" are common choices. In detective fiction, the name may also be preceded by the name of the detective: Inspector So-and-so: The Case of the Intriguing Title. Note that "A Case of..." does not, for whatever reasons, carry the same connotations. "The Case of..." is clearly a mystery of some sort; "A Case of..." is just something that happened (or possibly an infectious disease). Case Closed unsurprisingly, uses this for several episode titles, including "The Case of the Mysterious Gifts" and "The Case of the Hijacked Department Store". Spoofed in Cuticle Detective Inaba. The part after the 'of' typically doesn't make sense. Everything else in the manga, even less so. The Firesign Theatre has Nick Danger: The Case of the Missing Shoe and Nick Danger: The Case of the Missing Yolk, both sequels to their hit, "The Further Adventures of Nick Danger". "The Case of the Chemical Syndicate" is the story from DC Comics' Detective Comics that introduced Batman to the world. Sensation Comics's Dr. Pat feature had a pair of stories titled The Case of the Absent-Minded Doctor and The Case of the Mechanical Brain. "The Case of the Crushed Cake" of Sunnyville Stories involves the protagonist Rusty trying to figure out who really destroyed a prized cake. Stephen Fry once wrote a Sherlock Holmes fanfic, titled The Case of the Laughing Jarvey. The Strange Case of the End of Civilization As We Know It features John Cleese playing Sherlock Holmes' grandson Arthur. In The Facts in the Case of Mister Hollow "Mister (Johnny) Hollow" is the photographer who has sent a mysterious photo of four figures at a campsite to an Occult Detective investigating paganism in Ontario, Canada. The Strange Case of the Cosmic Rays, one of several edutainment movies from The '50s, produced by Bell Labs and directed by Frank Capra. The Hardy Boys used this a few times, with titles like The Case of the Counterfeit Criminals and The Case of the Psychic's Vision. Nancy Drew had a few, like The Case of the Disappearing Diamonds, and The Case of the Vanishing Veil. H. P. Lovecraft's The Case of Charles Dexter Ward. Harry Turtledove's humorous Alternate History Hardboiled fantasy, The Case of the Toxic Spell Dump. The Encyclopedia Brown series has used this many times, with titles like Encyclopedia Brown and the Case of the Dead Eagles and Encyclopedia Brown and the Case of the Disgusting Sneakers. An early proto-example from before the trope was properly codified is "The Facts in the Case of M. Valdemar", a horror short story by Edgar Allan Poe. The Hank the Cowdog children's mystery series began using this beginning with the eighth book in the series, The Case of the One-Eyed Killer Stud Horse. At this point, the majority of the books in the series follow this template. The Western Mysteries uses this naming scheme, with The Case of the Deadly Desperados and The Case of the Good Looking Corpse. While none of the individual Sherlock Holmes stories use this template, the last-published collection, The Casebook of Sherlock Holmes, at least suggests it. This is possibly an example of Beam Me Up, Scotty!, as virtually every Sherlock Holmes pastiche or parody uses the format, yet the actual stories almost always use "The Adventure of X" instead. "A Case of Identity" comes close. Baroness Orczy (author of The Scarlet Pimpernel) published a collection of detective stories called The Case of Miss Elliot, which was also the name of one of the stories. Almost all of the books in The McGurk Organization series by E.W. Hildick were titled this way. One of John Dickson Carr's Dr. Gideon Fell mysteries is The Case of the Constant Suicides. Every single one of the eighty-two Perry Mason novels was named using this pattern. The Strange Case of Origami Yoda, first book in the Origami Yoda series. Find Your Fate! Mystery #7 was called The Case of the House of Horror. The third collection of Isaac Asimov's "Black Widowers" stories is Casebook of the Black Widowers. Anthony Boucher was very fond of this naming pattern. The majority of his novels used this, including the first, The Case of the Seven of Calvary and the last, The Case of the Seven Sneezes. Supernatural had an episode named "The Curious Case of Dean Winchester". CSI season eight had an episode named "The Case of the Cross-Dressing Carp". 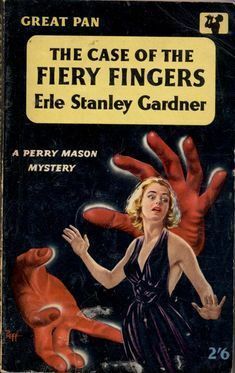 Every episode of the Perry Mason series followed this template, following Erle Stanley Gardner's novels. The Case of the Dangerous Robin was a humorous 1960's adventure series about an insurance investigator who chased thieves. The Avengers had an episode called "The Curious Case of the Countless Clues"; in the story a killer seeded his crime scenes with false evidence and, in the guise of a detective, implicated someone else for the murders. The Mathnet segments on Square One TV were generally named this way, though in the first season they were usually named "The Problem of..." instead. The BBC Radio 2 spoof series, The Newly Discovered Casebook of Sherlock Holmes has used this pattern a few times in episodes like "The Case of the Clockwork Fiend" and "The Case of the Deranged Botanist". 1971's The Case of the Elusive Assassin, a board game based on the writings of Ellery Queen. The Crimefighters game introduced in Dragon magazine #47. A sample adventure in the magazine was called "The Case of the Editor's Envelope". Tennessee Williams has a one-act play named The Case of the Crushed Petunias. The Case Of The Cautious Condor was a mystery/adventure game; the first original PC game released exclusively on CD-ROM. The remakes of Dragon Quest IV title the first chapter "Ragnar McRyan and the Case of the Missing Children". Bad Machinery is about two trios of young teenagers who are obsessed with solving mysteries. All the chapters take the form of ''The Case of the..."
An episode of Rugrats was titled "The Case of the Missing Rugrats". "The Case of the Stuttering Pig" (a Porky Pig cartoon, natch). The Bugs Bunny cartoon "Case of the Missing Hare" (about a mysterious magic trick, not detectives). Teenage Mutant Ninja Turtles (1987) had episodes titled "The Case of the Missing Pizza" and "Case of the Hot Kimono". C.O.P.S. episode titles all began with "The Case of..."; for example. "The Case of Big Boss' Master Plan". Courageous Cat and Minute Mouse had every one of its episodes titled "The Case of..."
Parodied in Gravity Falls, where a book (starring a knock-off of The Hardy Boys known as The Sibling Brothers) is titled The Case of the Caper-Case Caper. A first-season episode of The Little Rascals was titled "The Case of the Puzzled Pals". On the Franklin All-CGI Cartoon spin-off Franklin and Friends, many of the stories involving the Super Cluepers (Franklin and his friends dressed as mystery-solving team) are titled this way.